Welcome to Sport Fishing Fleets in Ixtapa Mexico, Ixtapa Sport fishing Boats has a excellent captains and the most reasonable prices for you to enjoy fishing with friends and family. We have sport fishing charters of 26 feet super pangas, Middle sportfishing cruisers of 31 foot and big boats 36ft 38 and 40 feet boats. 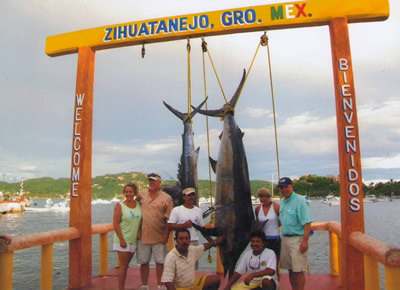 Our captains will enjoy taking you out fishing deep sea or small game fishing , Zihuatanejo is well know as one of the best places in Mexcio for Sport Fishing, Sail fishing, Marlin Fishing and Dorado ( Mahi Mahi). Any of this boats listed can also take you inshore fishing for yellow tails, black tuna, cooker, Spanish mackerel, and more , there is more action on small game fishing recommended for families so kids can have some options to catch some fish. Another option will be small game fishing and snorkeling , you can spend some hours fishing from 7am till 11am and then to the famous beach of Playa Las Gatas where you can practice snorkel and swimming while we are cooking the catch of the day for you to have it for lunch at the restaurant .